This charming chalet style home is a comfortable log cabin design with a practical open concept design. The Alpine is a beautiful log home with an eight by 26-foot deck off of the open kitchen, dining room and living room with lots of large windows to let in the natural light and bring in the surrounding views of the outdoors. The main floor also has two bedrooms and a bathroom. The upstairs is dedicated to the spacious master suite bedroom, with a closet and a full bath with a dormer for added space. The Alpine log cabin designs is 1,352 square feet, with three bedrooms and two bathrooms. This is a nice sized log cabin designs to use for a vacation getaway home. Like it’s namesake, the Alpine is the perfect log cabin design to build on the side of a mountain with scenic views all around, that can be seen from the numerous windows in the open concept living area. The Alpine log cabin design has a rustic elegance that you can’t help but love. The cathedral ceiling in the open concept living, dining, and kitchen area would suit a nice stone fireplace to become the central focus of the area. There is something about stone fireplaces that we can’t resist, a place to sit around with family and friends and enjoy the scenic views. A stone fireplace is a good way to anchor the room, with the stone fireplace becoming the focal point of the room. The combination of wood and stone is a lovely way to compliment the natural surroundings, and you can only feel good about using natural building materials that add to the character of the log home. When it comes to designing and building your log house, choosing the log homes plans and designs is just the first step. The details that go inside of your log house and log cabin designs are some of the other options you will have to decide upon. The stone masonry is an excellent addition to a log house design if it’s in your budget. A stone fireplace is the heart of many log house designs. Costs for stone masonry can vary widely depending on your choice of real full-stone masonry, manufactured stone veneer, or thin-cut natural stone. Depending on the type of stone fireplace you want your costs for this detail will vary. To determine stone masonry costs, you must look at the materials and the labour costs together. There are both pros and cons to each style of stone masonry project, and you will want to research them before you decide what you want. With so many log homes plans and designs, there is something for everyone. 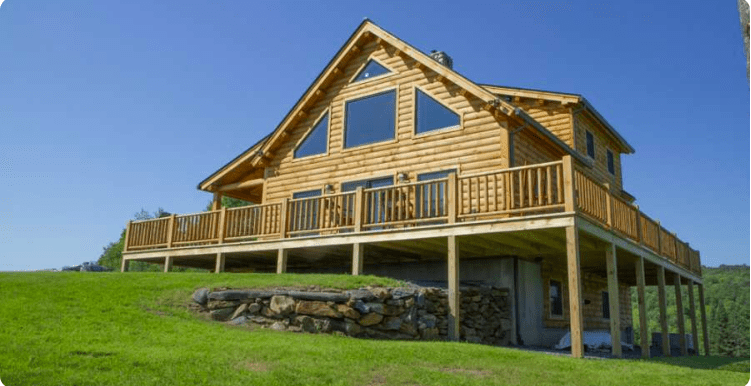 The log homes including the Alpine log home are built at the mill at Coventry Log Homes where they produce three log cabin package options from the shell, the log wall, and the complete log home package in a variety of log profiles. So there are even more options to choose from which allows people to find something in their price range.